Re-purposing the "Queen of the Fleet"
Continuing in its mission and vision to develop a world-class museum and visitor experience, one that shares Delta Air Lines’ aviation history with the world, Delta Flight Museum acquired Ship 6301, N661US, the first Boeing 747-400 ever built, to support its on-going goals and objectives. Ship 6301, also known as the “Queen of the Fleet,” having logged more than 86 million miles, was turned into a multipurpose extension of the existing museum, a facility that now includes event space, filming support and interpretive exhibits. The siting of the 747-400 required extensive master planning taking into account the airframe’s 232-foot length, 211-foot wingspan and the existing museum’s facilities, which are located in the heart of the Delta Air Lines’ corporate headquarters. The stature of the aircraft was utilized to create a highly visible entrance to the entire museum with plazas underwing for shading, access to the underside of the aircraft and other visitor amenities. Providing an engaging and educational venue was the primary goal of the Delta Flight Museum. The basic planning concept preserved the forward half of the aircraft in an almost existing state. This area was also modified to allow camera tracks and rigging for filming. Guests have access to lay flat seating, galleys and flight attendant support areas. The back half of the aircraft was stripped of all seating creating a highly flexible multipurpose event space with interpretive panels and graphics. Additionally, all of the interior wall panels were removed exposing the structural, and M/E/P systems of the aircraft. Floor panels were replaced with structural glass flooring allowing for views into the cargo bays and inside the wings. 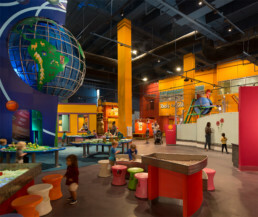 Spot and accent lighting carefully illuminates exhibits and interpretive panels. The unique and iconic upper-level seating area was also left in its original condition. Access is also provided to the flight crew sleeping quarters and the flight deck cockpit, where one can imagine steering the aircraft from 35 feet off the tarmac. Stevens & Wilkinson worked with Delta Air Lines to create exhibition space for Delta Flight Museum’s new 747 Experience display.